Today I have a secret recipe for Wings ‘N Things Buffalo Chicken Meatballs. This dish is very easy to prepare at home and makes for great party food or a tasty game day appetizer. 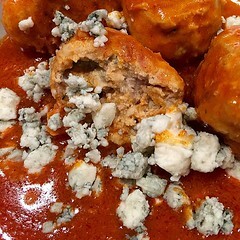 This recipe makes a batch of meatballs with mild heat. If you want your meatballs extra spicy, add some crushed red pepper flakes to your Buffalo sauce. Using your hands mix together. Drop by the teaspoon onto a baking sheet lined with foil and sprayed with pam. Bake at 350 for 25-30 minutes or until cooked through. Transfer to a slow cooker and top with buffalo sauce. Cook on low to keep warm. Cook over medium high heat and whisk until combined and butter is melted. For smooth dressing place all ingredients in a food processor and blend until smooth. Or, you can mix all ingredients in a bowl and stir until combined. Let dressing marinate for an hour or more before serving. Refrigerate leftovers in an air tight container.